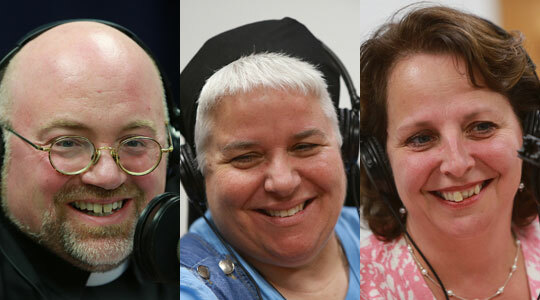 Summary of today’s show: Sr. Lisa Valentini and Maureen Heil return to The Good Catholic Life to talk about the missions, mission trips by high school students, the Holy Childhood Association, and the mission group traveling from the Archdiocese of Boston to the Dominican Republic and sponsored by the Office for the New Evangelization of Youth and Young Adults. Scot Landry and Fr. Chip Hines talk with Maureen and Sr. Lisa about the amazing benefits of taking young people on mission trips for both the kids going on the trips and those to whom they are witnessing to Christ. 1st segment: Scot noted that the US bishops are having their semi-annual meeting, this time in Atlanta. People can follow along at USCCB.org. Scot said they’re reflecting on the 10th anniversary of the Dallas Charter for the protection of young people related to sexual abuse. The other major topic is the upcoming Fortnight for Freedom for religious liberty. Fr. Chip said he thinks the Fortnight is gaining steam and in his parish they’re making preparations. It’s also good to review the charter and see how it’s going. The Fortnight is June 21 to July 4 and all Catholics are asked to enter a period of prayer, study, and action to preserve our most cherished freedom, religious liberty. Fr. Chip recommended people see the new movie “For Greater Glory” about how people can lose their religious freedom even in a Catholic country. Scot said Cardinal Seán will be hosting a live town hall meeting on June 25 on CatholicTV and simulcast on WQOM. Viewers will be able to submit questions via Facebook, Twitter, and email. 2nd segment: Scot welcomed Maureen and Sr. Lisa back to the show. Scot asked Sr. Lisa to refresh listeners about her ministry. She is a native of a small town in Pennsylvania and grew up with one brother and four younger sisters. She said she was asked by a religious sister if she had a vocation to religious life and the idea got stuck in her head. She realized she thought if God wants it for her, it would be cool. She joined the Sister Servants of Immaculate Mary and she remembers hearing stories from sisters serving overseas and being very moved. One day, while teaching first grade she came across the statistic that one billion people have never heard about Jesus. So she asked to be sent to Peru, but she ended up in an all-girls academy for rich kids. Then she learned that the Sisters serve the rich in order to inculcate them in the service to the poor. She met with parents and told them that she would only stay in the school if she could expose their children to the service to the poor. The parents wanted this for their kids. Every week, they took the girls to the orphanages. One day, a first grade girl came to her upset. One of the kids had a ripped shirt and so the next time the little girl brought three of her shirts to one of the orphans. It was then that the other kids got the same idea. From that day on, they never came without bringing something. Sr. Lisa was in Peru for five years until she was called back to the United States. Then she was sent to work for the Holy Childhood Association in Philadelphia and her job was to go around and talk to kids about missions. She told the story of a woman who came to her door looking to get her baby baptized. She told her the priest wasn’t there, but the mother said her baby was very sick. The doctors had told her it was going to die. So she took her into the chapel and led her through the rite of baptism and she was able to baptize in an emergency because she was there as a missionary. This is the kind of story she told American kids about the missions. The kids started demanding to go on mission trips with her. During the summers in that period, she was going on mission trips and the kids wanted to go with her on the missions. She’s been going to Haiti for 21 years and knew it was too dangerous to take kids there. She was also going to Mexico at the time and so they took kids there. This year will be her 39th mission trip and it will have been hundreds of kids. In 1997, Sister transferred to the Missionary Sisters of the Most Sacred Heart of Jesus because she felt called to be a full-time missionary. They went to Mexico on the mission trips until 2000 and then they switched to the Dominican Republic. Five years ago, Sr. Lisa heard from one of the families from Peru that had moved to Toronto. Three of the girls who she taught as first graders in Peru contacted her and wanted to go with her on a mission trip to the Dominican Republic. She also said among the kids on the missions, five have entered religious life, one is a priest, and four are in seminary. Scot asked Maureen how she met Sr. Lisa. She said it was when she worked for the Holy Childhood Association office in Allentown, Pennsylvania. She was always looking for missionaries to go into schools with her and talk to the kids. They’d known some of the same people in the missions as well. Sr. Lisa made herself to speak whenever she was in the country. Maureen said now that she’s in Boston she’s in this archdiocese very often as well. Scot said Holy Childhood is one of four Pontifical Mission Societies. He asked her what it is. Maureen said HCA is the junior Society of the Propagation of the Faith. It started in the 1800s when a French bishop came to the US, which was then mission territory, and traveled from New York to New Orleans and up to Canada. He went back to France wanting to bring the Catholic faith back to the US. So he went to the schoolchildren of France to pray and sacrifice a penny per month. They prayed one Hail Mary per month and they had to earn the one penny. Those donations went to the US and to China. His main concern was the babies were dying unbaptized. After only six years it went international and the first US office opened in Baltimore in 1853. Cardinal Sean has asked that HCA be in every Catholic school and religious education program. They show kids what the kids in the missions have to live with, including the poverty conditions, but mostly that they don’t know Jesus. Maureen said they went to a school this week and the kids were so excited that what they were doing as part oft he HCA was making a difference in the real lives of others. Sr. Lisa said the kids know how lucky they are to have what they do. Maureen said they know how important it is to sacrifice and pray every day. It’s not just an Advent or Lent thing. They have something in every month. One is the World Mission Rosary created by Archbishop Fulton Sheen during the month of October. They have a saint of the month every month, missionary saints that aren’t necessarily well-known. Her favorite recently was St. Mathilda, the wife of a king who died. By choosing a different son as successor and set off a war. The sons reconciled and banned mom to a monastery. There she entered a life of heroic virtue that led to sainthood, which shows how a mistake in life can be overcome to end up in canonization. Scot said Sr. Lisa is leading a pilgrimage this summer to El Factor, Dominican Republic. Sr. Lisa was stationed there in 2000 where she was principal of two pre-schools and in charge of choir and youth group. In her parish, there were no priests living there, so the sisters were the connection to parish life. She was also the only driver and so she was the ambulance. They knew that the sisters were their sisters in that town. The people are so welcoming to missionaries and it’s amazing to see the good done by the young people. There are two groups from Pennsylvania who go every year. One group is going to down on July 3. The missionaries are supports to the parish now and so they are welcomed. When they are there, they do a lot of catechesis in the mission church and some of the 20 mission chapels. The children of the area are waiting in anticipation for the mission group. They have 100 children per session. They do arts and crafts activities with the kids, sing songs, and pray with them. They will fly into the capital and take a bus for about two hours to El Factor. Five miles from there is a small city with a little supermarket. The area is the rice-growing zone and the people are simple farmers. There is no running water in the homes. They have an aqueduct now, about 8 years old, and the people fill buckets from a spigot two times per week. The also only have intermittent electricity. Scot asked if people are going hungry. Sr. Lisa said people used to have enough, but poverty is getting worse. Some families are going hungry. Generally, there are fruits that grow which can take the edge off, but it’s not complete nutrition. There is high unemployment and the educational system isn’t good. Kids often leave school to work on the farms. Sr. Lisa said they try to pair American kids with Dominican teens to do catechesis for the younger kids. This is eye-opening for the Americans on the dedication to the faith. The Boston kids will also have time for leadership formation. Maureen said her son Alex went on a mission trip to the Dominican Republic with Sr. Lisa. She said it’s a leap of faith for parents to trust the kids with being out of communication for two weeks when they used to constant contact. there’s a sense of pride in watching her children choose to go on missions, especially when the idea comes from them. Fr. Chip asked what the youngest age they will take. Sr. Lisa said they have to have finished their junior year of high school because she needs to count on their maturity and also so they can get full advantage of the experience. It can’t be all about them and until about 17, they are not quite ready for that. She said the Boston kids have been on a leadership track and they have done a lot of preparation for this trip, including retreats. For her kids from Pennsylvania, she meets many times with the kids many times before the trip. She has asked them to fast for a month. In Boston, Danielle Olsen has challenged the teens to fast for 56 days prior to the trip and to go to Mass more in preparation. Maureen said this also affects the family when the child is fasting from something. Parents have to adapt to respect that choice. But when they come back, parents will see the changes both subtle and obvious: respect for others, more reverence in church, and so on. Fr. Chip asked what the spiritual fruits of the mission work later in their life? Maureen said they will be the kids who will get involved in Newman Centers or get involved in local parishes, perhaps teaching religious education. She said one parish in Virginia threw a big graduation party for college students who had been volunteering 15 hours per week at the parish. These 20 or so kids had in common going on a mission trip. Maureen said it’s the compelling stories that start in the younger kids. When they’re older they go on the trips. And as adults they retain those experiences and have stories of their own. Sr. Lisa said she has many of the kids she talks to in grade school seek her out years later and want to go on mission trips. Then in college, the kids often major in social justice majors or minor in Spanish or something related to their experience. Scot said he was moved by the Office for the New Evangelization of Youth and Young Adults’s brochure to advertise the trip. It said the cost of the trip was $1,200 per kid, but they wanted them to rise the money to go in order to involve many others so that they can participate in this mission trip. Sr. Lisa said it’s the whole Archdiocese of Boston. She said the kids are going to people to get material for crafts donated, to dentists and doctors for first aid items, and more. But no one should buy donations. People can be missionaries to give by going, but they can also go by giving. Maureen said they had the kids write to every single person they know to ask for even one dollar and they would be praying for their donors and the donors would be participants. Sr. Lisa said the mission kids have a calendar and are putting names on it of people they will be praying for. Scot said Fr. Matt described the activity of catechizing, spending times with the village people, learn the culture, spend some time at the beach, pray, grow in the relationship with Christ, and come home with unforgettable memories and stories. Sr. Lisa said they will also come home with great photos.The Dominicans love pictures and the people there treasure the photos and hang them on the walls of their homes. The people fall in love with the missionaries and ask for them by name when Sr. Lisa goes back. Sr. Lisa said the people of El Factor are amazed how the people of American spend money to go there and work hard. They know what our lives are like here and wonder they come. Maureen said the only reason is the love of Jesus. Sr. Lisa said it will be two weeks long. Maureen said the yearly HCA art competition is nationwide and involves 10,000 kids. This year two kids from Boston were among the winners. Hello I am Molly Gutierrez from St. Dominic Savio in Bellflower, California. I actually met Sr. Lisa Valentini today for the second time. She is so easy to relate to and her stories are always amazing. Is there a way I can get her email and where do I go after I finish High School so I can go with her to help people with her as a missionary.